Also, does any one know what all Mods Phantom has created, and where I can get them from? I really like his stuff. He's been around on the forum lately, just not very often. I think he's busy or something. Most of his recent posts have detailed to us the difficulties that his FT staff have been having, so he's probably getting a bit tangled-up in everyone's constantly changing schedules, and of course his own. I don't know of any Mods other than FT that he has done, so I can't really help you there either, but I thought you might appreciate at least a little outside insight. hey trek why donr u search for phantoms mods on the internet rather then asking other people. Future was also going to be accomidated with Past and Present to make up the Tense Trillogy which has now changed to 1, 2 and 3 for ease. Present Tense was basically a Dominion War/Nemesis/Hidden Frontier like Mod Essencially that'd explain the link between the end of Canon Trek in the 24th Century and the start of Future Tense. 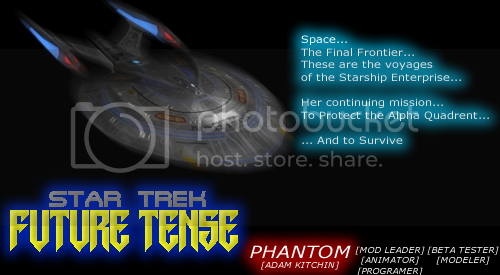 hey phantom past tense was cancelled or summat there's only some ships from the mod like the nx-class and andorian crusier is it still running if so wer can i get it from? Do you know where i can find past tense? i wana check the mod out. thought so lol. oh well ts jus futre tense now if only there was a demo of it. you kknow the botf mod is that for a1 and if so were can i find that i dont think iv tried that one yet andis it any good?